Veterans Day is not just a day off or about Veterans Day Sales….. Please join us in honoring and acknowledging veterans on November 11th. We are collaborating with What They Signed Up For to bring you a free event where veterans and their families will share their stories of deployment to combat and readjustment at home. The public can listen and learn at this meaningful celebration. It’s at the Rainier Arts Center (3515 South Alaska St.; map) in Columbia City, 3-5 pm Sunday. Find more information, and an RSVP link, here. Seattle Fire on scene at the 4700 Blk. of E. Marginal Way S. for report of possible suspicious package in mailroom. Building evacuated as precaution. HAZMAT team investigating. 11:48 AM UPDATE: Per scanner, the package was opened, “just a bunch of brochures, no hazard,” and the situation should be winding down. Just looked it up after questions via text. Fireworks tonight across Puget Sound for the Whaling Days festival in Silverdale. It’s been audible here in the past – next year we need to set a reminder! Two C-17 military aircraft will arrive at Boeing Field at about 11:30 a.m. and 1 p.m. on Thursday, July 12, as part of a drill involving the medical transport of people “injured” in a fictional national disaster. The flights will be met by emergency responders and medical personnel, who will transport the “patients” to area hospitals. Nearly two dozen local, state, federal, and private organizations, led by Madigan Army Medical Center at Joint Base Lewis-McChord, have worked together since October to plan the exercise—which is required to maintain the airport’s status as a part of the National Disaster Medical System. We asked airport spokesperson Brent Champaco if any other aircraft would be participating; he replied that you might see a military helicopter too. That photo was texted to us by someone wondering what was on fire somewhere beyond Blake Island. We looked around and finally got the answer in a tweet a few minutes ago from South Kitsap Fire and Rescue: “Crews are on the scene of a 2-alarm brush fire in the 2800 block of Long Lake Rd SE. Battalion 8 is advising the fire is out and we are mopping up.” Here’s a map – the fire scene is west of the Southworth ferry dock. 7:15 PM: The fire generating that smoke is a building in the 3600 block of E Marginal Way, not in WS. [map] Seattle Fire is going defensive on it – too dangerous to do otherwise. Per scanner, it includes ‘two metal structures, fully involved’ with propane tanks nearby. Avoid the bridge if you can- very smoky. The fire is still spreading per scanner and you’ll want to stay far from E. Marginal too. 7:43 PM: SFD is calling a third alarm. We are going back over the bridge. 7:46 PM: Third alarm canceled. Some vehicles reported to be on fire. 8:06 PM: SFD is reporting progress knocking down the fire but also still calling for more reinforcements. Meantime, thanks for all the photos – we’ve just returned to HQ (we were out in the Alki area checking on the holiday scene when this broke out) and are catching up while monitoring this via scanner. Also, as we noted in a comment, we apologize that our image-upload-in-comment feature is not fixed yet, so even if it looks to you like it’s uploaded, it’s not showing – photos are always welcome at westseattleblog@gmail.com. 8:41 PM: Still fighting the fire, and reporting progress – “well under control” is how it’s been described over SFD radio. That’s a “live” SDOT cam view. 8:30 PM: If you’re seeing smoke to the east – Seattle Fire has a big response arriving at what so far is described as a “fully involved” barge fire on the east side of the Duwamish River. Crews are responding to S. Myrtle in Georgetown (here’s a vicinity map). 9:44 PM: Radio activity has slowed. We’re continuing to monitor. Still no reports of any injuries. 7:33 PM: Thanks to those who sent photos (the one above is from Jamie) – the smoke you are (or were) seeing is from what Seattle Fire has initially described as an RV fire that spread to a building at Colorado and Hanford in SODO [map]. 7:37 PM: SFD says the fire’s out and no injuries were reported. The SFD crew that remained on scene confirmed no one hurt and no significant damage to the building, which is open-faced and holds metal materials. This was along his route home. 2:29 PM: Thanks for the tip about a Highway 509 closure – south of here but just in case you’re headed that way: WSDOT says it’s closed in both directions near Sea-Tac; if you’re headed southbound, you’ll be diverted to S. 160th; if northbound, you’ll be diverted to S. 188th. Per King County Sheriff’s Office scanner traffic, they’re investigating gunfire. 2:33 PM: State Patrol says 4 cars were hit, no injuries. 4:32 PM: The search is currently focused at the south end of 509, at 188th, but the backup on 509 is reported to start much further north, so if you have to head south, we’d advise non-509 routes. An official “pineapple cutting” will start the opening ceremony at 8:45 tomorrow morning, and the first 112 people there will get free fresh organic pineapple. The store opens at 9 am. It’s in what used to be a Albertsons at the Five Corners Shopping Center, 15840 1st Avenue S. It’s 25,000 square feet, the same size planned for the new West Seattle store, expected to open by “late summer” next year. The Seattle Department of Transportation advises travelers that due to utility construction in support of the replacement of the existing water main, northbound 1st Ave between Yesler Way and Columbia St will be closed for approximately 5 months. Additionally, the curb lane of southbound 1st Ave between Columbia St and Yesler Way will be closed for the same duration. *Westbound S Jackson St between 2nd Ave S and 1st Ave S. These blocks are scheduled to open by May 25. *Northbound 1st Ave S between S Jackson St and Yesler Way. These blocks are scheduled to open later in the summer. *Southbound 1st Ave S between Yesler Way and S Jackson St is occasionally closed, 9:30 AM – 3 PM. These closures are expected to conclude by the end of May. *S Main St between 1st Ave S and 2nd Ave S is closed in both directions, 7 AM – 5 PM weekdays until May 23. Please visit the project webpage for more information. S Lander St will close as early as the evening of May 22, 2018 as part of the Lander St Bridge Project. S Lander St will be closed to traffic from 1st Ave S and to 3rd Ave S through early 2020 while the new bridge is being built. Pedestrian and bicycle rider access will be maintained, as will access to all adjacent businesses along S Lander St.
As an alternative to S Lander St, use S Holgate St or S Spokane street to move east and west across the BNSF railroad tracks. Access to S Lander St from Occidental Ave S, on both the north and south sides of S Lander St, will be closed. This closure will be in place during bridge construction and made permanent once construction is complete. A small portion of 3rd Ave S, at the south side of S Lander St, starting at the north driveway at Republic, will also close as early as May 22. This closure will be in place until summer 2019. During the closure use 4th Ave S to move north and south and access businesses on S Lander St. If you have questions or concerns, please contact the outreach team at lander_bridge@seattle.gov or 206-256-5450. Because of the strong WS/SODO connection, the project had long been of interest to people on this side of the river, including the West Seattle Transportation Coalition; the project achieved full $123 million funding last year. It’s been almost 10 years since we first published news of a new burger joint headed this way – Zippy’s Giant Burgers, which almost instantly became mega-popular. It outgrew its original Highland Park location, and after almost three years in operation, announced it was moving to a bigger space in White Center. After three more years came news a second Zippy’s would open in Georgetown. Some months back, a few readers pointed out that location was listed for sale. It’s still for sale, Zippy’s announced today … but in the meantime, it will close at the end of this month. Via social media, proprietor Blaine Cook wrote this morning: “I’ve never claimed to be a business man or a restaurateur. Just a simple man that saw an opportunity and went for it. As the years pass it’s become quite apparent that I don’t have the personality or the temperament to oversee the operations of two restaurants.” March 31st is listed as the last day Georgetown (5633 Airport Way S.) will be open; White Center (9614 14th SW) soldiers on. So East Marginal/surface Alaskan Way will be closed north of the West Seattle Bridge, between Spokane St. and Atlantic St., during those four hours this Saturday night/early Sunday for the move back. South Seattle College’s Georgetown Campus will host the seventh annual Seattle Stand Down on Dec. 14-15, where homeless and at-risk Veterans and their families will be offered free access to a wide array of resources and services. Seattle Stand Down is a one-stop shop for resources and services available to Veterans who currently lack permanent housing or simply need a “hand up” in order to prevent homelessness. Representatives from local businesses, non-profits, educational institutions, and all levels of government will be on hand with volunteers to provide medical screenings, eye exams, dental services, legal aid, employment opportunities, housing assistance, case management referrals, haircuts, personal hygiene items and meals. The two-day event will offer employment assistance through a partnership with SSC’s on-campus WorkSource Office and the King County Veterans Program. Extensive legal resources will be provided by the NW Justice Project and Davis Wright Tremaine, LLP. Seattle Stand Down is unique from other stand down events in that it provides designated areas for the safety and comfort of women Veterans. Providers will offer women-specific services including health care, advocacy, counseling, employment and personal care. According to the King County Veterans Program, at least 1360 Veterans are experiencing homelessness at this very moment within King County. In 2016, the Seattle Stand Down provided services to nearly 350 homeless and at-risk homeless Veterans in need. The Seattle Colleges District is the host of Seattle Stand Down for the seventh year in a row. The event was founded as a community service project of student Veterans at Seattle Central College, and is organized today by a group of dedicated Veteran volunteers from the colleges and community. Major funding for Seattle Stand Down has been made possible through a Veterans Employment and Training Service grant from the U.S. Department of Labor. Additional support is provided by the King County Veterans Program, funded by the Veteran and Human Services Levy. Location: South Seattle College’s Georgetown Campus as 6737 Corson Avenue South, Seattle, WA 98108. Participants will check in at the Gene Colin Education Hall – Building C.
Time: Running Thursday, Dec. 14 and Friday, Dec. 15 at SSC’s Georgetown Campus, the event opens for registration at 7:00 a.m. on Dec. 14 and services will be available from 8:00 a.m. until 4:00 p.m. that day. On Dec. 15, registration begins at 7:00 a.m. with services available from 8:00 a.m. until 2:00 p.m. Parking and Transportation: Free parking passes will be made available to Veterans receiving services. For both days of the event, King County Metro and Sound Transit have agreed to provide free rides for all Veterans. They must carry one type of four accepted forms of government ID, or the special bus pass Metro has printed for Veterans that lack identification (available at local social service providers). This means that Veterans with any one of the ID forms listed below can travel on any Metro and Sound Transit bus, and both the LINK light rail and the Sounder train. Attendees should use “CORSON AVE S & EAST MARGINAL WAY” as their destination if using trip planners. Anyone with questions on the best transit route can call Hopelink Mobility at 425-943-6760. Here’s the official flyer (PDF). 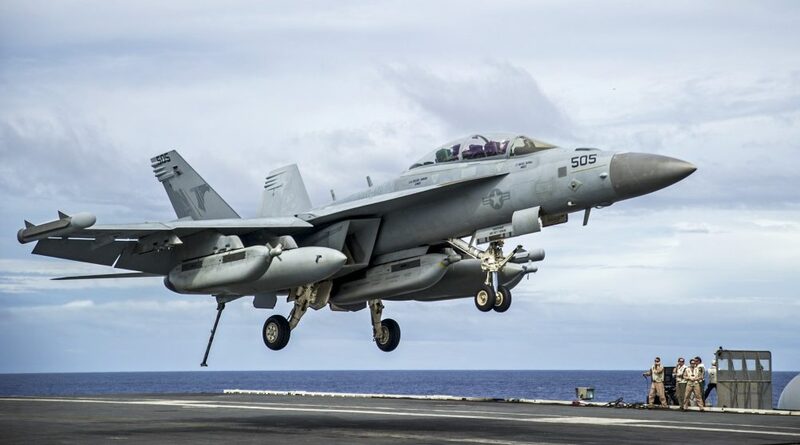 Three frontline Navy EA-18G Growler electronic attack jets will fly to the Museum on Oct. 12 to preside over the donation of a 10-foot aircraft carrier model to the Museum. The model will be presented by the officers of VAQ-130 Naval Air Station Whidbey Island to the Museum’s Education Office. The aircraft will arrive at 11 a.m. and depart at 2 p.m. One of the Growlers will be stationed in the Museum parking lot with crew members standing by to meet the public. The other two planes will be parked next to the Museum’s airport fence. The event is free. Vashon High School students have been dismissed for the day due to a bomb threat at the school. Law enforcement is on site doing an investigation, and expect to be in the building for the remainder of the day. Students and staff will not have access to the building for the remainder of the day. The announcement from superintendent Michael Soltman goes on to say that bus riders and walkers already have been sent home in those respective ways and “ferry commuter students” will be on an upcoming sailing, adding “Vashon Island High School sport practices, games and club activities have been cancelled.” Everyone is OK, and the island’s other two public schools remain in session. We’ll be checking with the King County Sheriff’s Office about the investigation. The school found what they said was a suspicious device in a locker. The school was evacuated. Turns out it was a portable cooler and the battery was beeping that it was low. The student was supposed to have it so it was a false alarm. Thanks to Terry for the photo – when we received it a little more than an hour ago, we couldn’t find any info about a fire in the Kitsap area, but now there’s info via Twitter: It’s a fire covering about an acre in the Illahee Preserve area, according to Central Kitsap Fire and Rescue. Meant to mention this in the daily preview list … that’s a post-game Mariners fireworks show you might have been hearing in the distance just now. They have one more planned this season, September 22nd. The Seattle Department of Transportation (SDOT) advises travelers that crews will be closing Fourth Ave S between S Washington and Jefferson streets from Friday, June 30 through Monday, July 3. This closure is needed to complete work as part of the Yesler Bridge Rehabilitation Project. The Yesler Bridge Rehabilitation Project will improve the safety and reliability of the Yesler Bridge while preserving its historical elements. For more information, please visit the Yesler Bridge Rehabilitation Project webpage.